This is a pretty exciting week to take part in #SundaySupper. We're all cooking recipes inspired by Sara Moulton, and in particular, we're featuring recipes from my personal favorite of her cookbooks, Sara Moulton's Everyday Family Dinners. Everyday Family Dinner's is one of those books. It happens to me more often than I'd like to admit. I see a book on the new release shelf of the library, bring it home, get through half of the book and realize that I have put sticky tabs on more pages than I haven't. Hello, Amazon! Mmmm-hmmm, one of those books. So yeah, it's been a well-loved book on my shelf for a few years now. Since I own more cookbooks than any one person has the right to own (you know what I'm talking about...there's more of you out there), I often find that though I can describe the cover of many of them off the cuff (or at least the spine) - I haven't actually cooked from them enough. Or as much as I'd like to. All I have to say to my daughter is "can you go get me that green and white cookbook from the shelf...again..." and she knows I'm talking about this one. And since today is all about Sara Moulton, I decided to adapt a recipe of hers that I've had marked forever. As in, since I first checked the book out from the library 3 years ago. 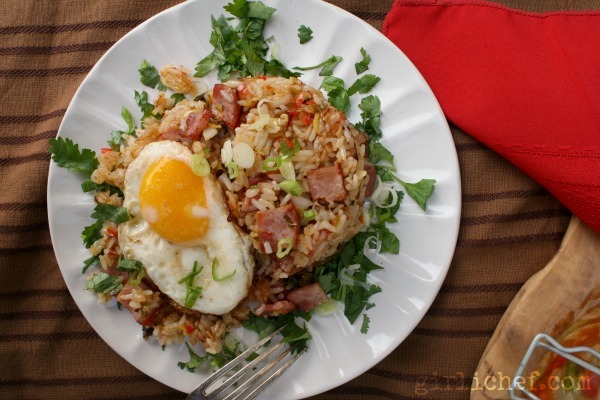 The recipe was Crispy Kimchi Rice with Fried Eggs. Aaaaaahhhh, yum. Instead of making a crispy rice "cake", I turned it into a quick fried rice. But I still added an egg or two on the top. 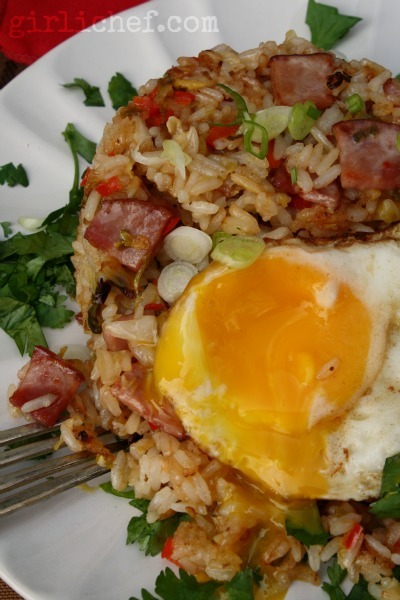 My favorite time to eat fried rice with an egg is for breakfast, so that's how we served this up. As a late breakfast. Stir together the rice, kimchi, and rice vinegar in a bowl and set aside. Heat about a tablespoon of oil in a large non-stick skillet or wok over medium-high heat, and add the Canadian bacon; cook for a couple of minutes, while stirring to brown. If the pan seems dry, add a drizzle more oil, then add the reserved rice/kimchi mixture. Cook, stirring constantly until everything is heated through, and the rice starts to turn golden in spots. Heat some butter in the bottom of a smaller non-stick skillet and fry up an egg or two per person. 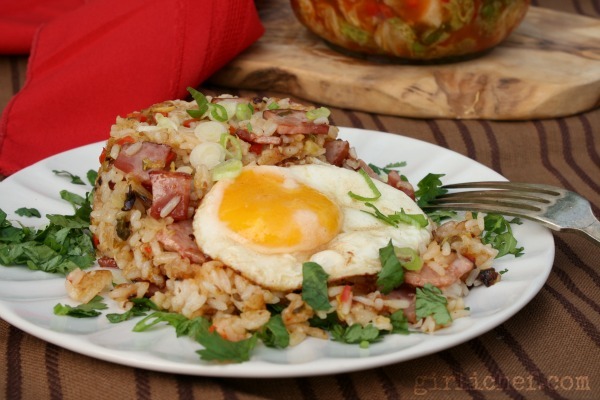 To serve, divide the fried rice among serving plates and top with the eggs. Sprinkle with salt and pepper. Scatter cilantro and scallions over each. Enjoy! Cut the cabbage into quarters, through the core. Slice the core out of each quarter. Cut each quarter into large ribbons, about 1 to 1-1/2 inches wide. Toss the cabbage with the salt in a large nonreactive bowl, cover with plastic wrap, and set aside at room temperature for 2 hours. In the meantime, bring the vinegar, sugar, paprika, and cayenne to a boil in a small saucepan; stir to dissolve. Remove from heat and set aside. Rinse and drain the cabbage, then press it dry as best as you can. Rinse out the large bowl you used for the cabbage and dry it. Place the cabbage back into it, and add the red bell pepper, scallions, ginger, garlic, and the reserved liquid mixture. Toss until everything is coated and combined well. 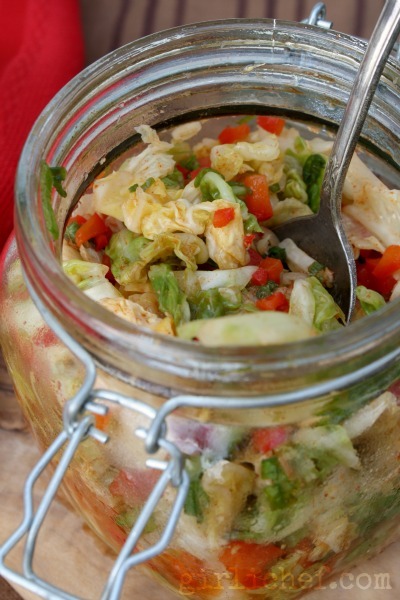 Pack the kimchi into a nonreactive (preferably glass) jar or bowl. Cover and refrigerate until ready to use. Will keep in the fridge for about 1 week. Alternately, you could whisk your eggs up in a bowl, and then cook them into fluffy scrambled eggs or an omelet (cut into strips once done). You could then fold them into the rice before serving. I don't know if it's strange or not, but I like to eat this for breakfast. Not that I wouldn't eat it for any meal of the day, but to me, it seems like breakfast fare!